I'm 16 years old and I bought a notoriously unreliable car sight unseen that is 4 states away in the middle of December in Northern Indiana. But bear with me here because I'm not quite as crazy as I may seem. While snooping around twitter one night, I noticed Rutledge Wood was answering questions from fans. Knowing he at one point had owned the 1986 Merkur used on the show and having worked on my dad's 1988 XR for most of my life, I naturally asked him what all had been done to the car. A few minutes later I got a response not from Rutledge, but from the then current owner Matt Hardigree. If you haven't read his story about getting the car, I suggest you do right here. "It was made to turn with the use of a non-welded diff, do you want it? It's for sale." The car really wasn't what I was initially looking for, but the price was right and I knew those cars like the back of my hand. 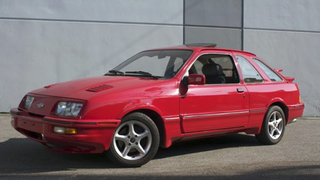 This was the most famous Merkur around. To quote Tanner Foust "it's not fate really, more like destiny" I had to have it. After some tweets and emails back and fourth, I had convinced my dad to let me buy the car. Now we just had to get it here. The car was somewhere in Virginia, a place where Matt no longer lived. Instead of taking a weekend rental down there and hoping the car would make it back to Indiana in the snow, I decided to have the car shipped. This was a hassle in itself but this isn't the place for that rant. After a few weeks of people at my school not believing my story, we got the call to go pick up my car in a nearby parking lot. Getting it home was a larger problem. As it was December in Indiana, there was some snow and ice. Snow and ice don't work very well with rear-wheel drive and tires that were abused by Tanner Foust. When we got it to the bottom of our driveway, it needed a push up. A 2 man push up the driveway in the cold. When it finally reached the top of the driveway, the car decided that it didn't like coolant very much and puked it all over. It was at this point that i suspected that Adam had something to do with the car, because not much was going right. A week later, we had the the issue with the cooling system sorted, the front brakes unstuck, rebuilt the broken fan, and addressed a few other issues. Also, I discovered the random assortment of goodies left in the trunk by mister Hardigree. I think he anticipated a breakdown at some point. There was also a fire extinguisher back there, I may keep it just in case I find Doug stranded on the side of the road. As we are having a pretty crazy winter here I haven't been able to drive my car very much. This probably isn't a bad thing taking into consideration that the heater doesn't work and the bald 3 Bridgestones and a Firestone have yet to be swapped out for some not hooned to death tires. To sum up, I love the car. The history, the dual wings, the cheese graters cut into the hood. I love the orangepeeling in the red paint, the black door jams, and that it has no passenger sun-visor for the in-car cameras. My story with the car is far from over. There is still work to be done, and many miles to be driven, In fact I have yet to have my first proper breakdown in it. As the weather gets nicer, the roads get drier and I do more work to the car, I will post more about it. Until then however, enjoy some pictures.